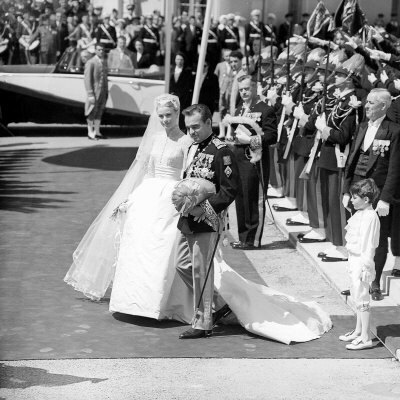 Royal Wedding Wednesday The Wedding of Prince Rainier and Grace Kelly has often been referred to as the wedding of the century. 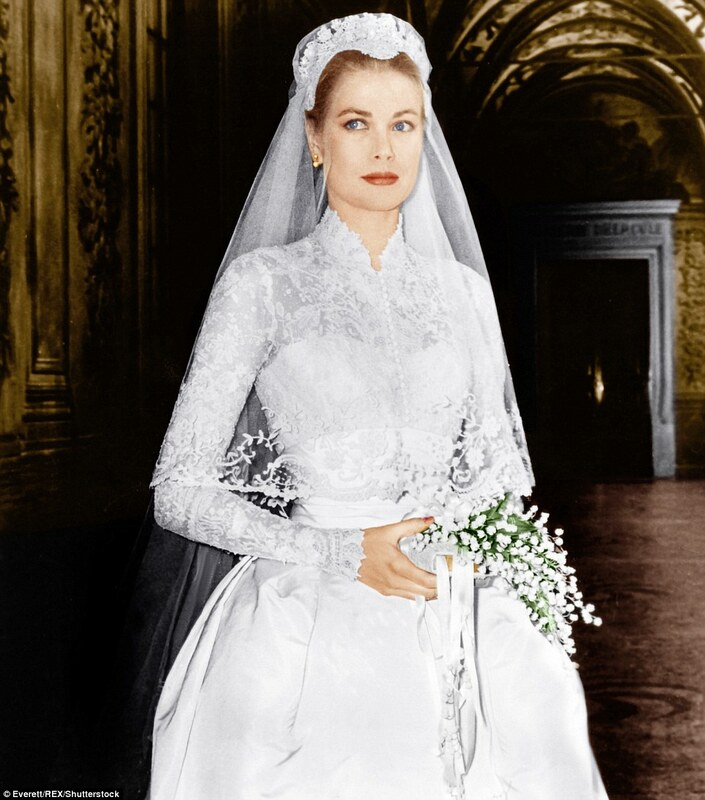 The fairytale story of how American actress Grace Kelly found the role of a lifetime. That of Princess consort to the Prince of Monaco, Rainier (pronounced Ren yay) Louis Henri Maxence Bertrand de Grimaldi. In last Fridays post, I covered the childhood and film career of Miss Kelly, as well as the story of how the two met and became engaged. To help celebrate the upcoming nuptials of Prince Albert II of Monaco to Charlene Wittstock I wanted to dedicate a Royal Wedding post featuring all the delicious details of the weddings of his parents. The couple had two ceremonies, a civil service as well as a religious service. The reason for this is that in Monaco, as well as several other European countries, religious weddings are not considered legal ceremonies. A religious ceremony can only be performed after a civil wedding has taken place. Their marriage was legally solemnized, according to the civil code of Monaco on April 18, 1956. The civil service was performed by Marcel Portanier, Monaco’s Minister of Justice, in the palace throne room. There were 80 guests in attendance, which included representatives from 24 nations. The couple exchanged their vows in French. During the ceremony, Grace’s 142 new titles were recited. They held a reception for the citizens of Monaco after the ceremony so that each one could shake hands with the new princess. 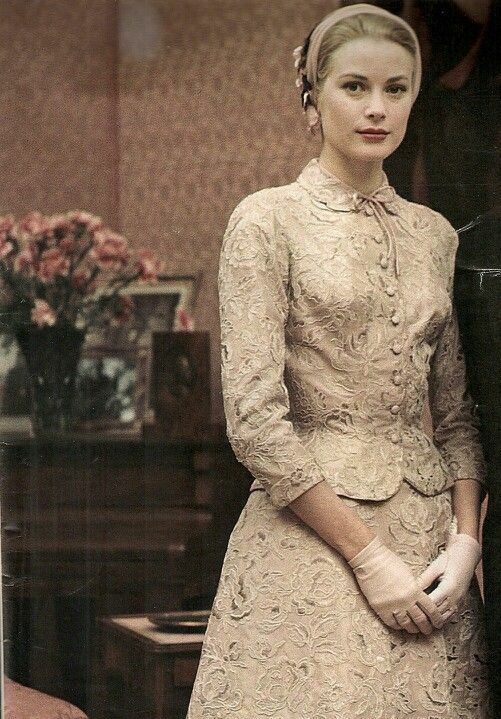 Her Serene Highness, Princess Grace, later admitted that her hand hurt for days afterward. A gala celebration was held at the Opera House that evening. 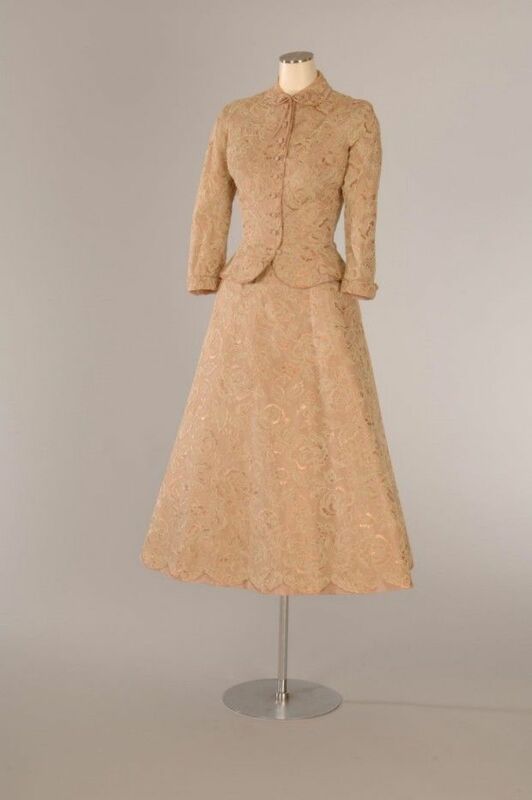 MGM designer Helen Rose, who had worked with Grace on the costumes for “High Society”, created the lovely two-piece suit she wore for the civil ceremony. The suit was made from ivory lace and dusty rose silk. The jacket featured a round collar, fitted bodice and three quarter length sleeves. The flared skirt was a mid-calf length. A pink close-fitting hat trimmed with silk flowers, pink silk pumps, and white gloves were elegant finishing touches. In 2010 the Victoria and Albert Museum in London showcased 50 classic Kelly pieces which included her wedding suit. Here is a close up of the lovely fabric and design. 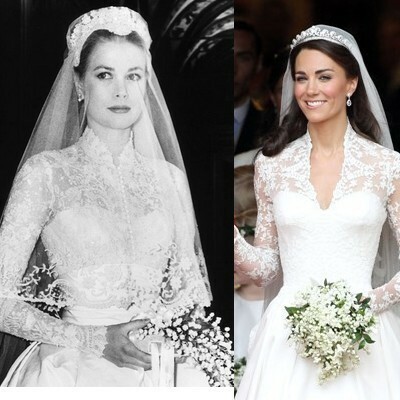 Ms. Rose was the designer also responsible for Princess Grace’s fabulous traditional wedding gown. At the time it was customary for studios to create wedding gowns for their stars and MGM graciously gifted Miss Kelly her headpiece and gown. Her shoes were designed and created by David Evins. The gown and all the remaining accessories were created in six short weeks and required over three dozen seamstresses. The dress, wedding headpiece, undergarments, petticoats, and prayer book were all created by hand. The gown had a high neck and long sleeves. The bodice featured a fitted under bodice topped with a lace bodice made from delicate rose point lace (a type of nineteenth-century Brussels needle lace that features elaborate floral motifs). The 125-year-old Brussels lace was detached from its original ground and shaped to the bodice so that the seams would be invisible. It was then accented with hundreds of hand-sewn seed pearls. The bell-shaped skirt was made from 25 yards of ivory silk faille (peau de soie) and 100 yards of silk net (peau de soie tulle) which was supported by three petticoats ~ smoothing petticoat, ruffled petticoat, and foundation petticoat. The back of the skirt featured a triangular tulle and lace train insert and was topped with a pleated silk faille cummerbund. This image provides a good representation of just how many yards of fabric and tulle were required for the design of the dress and veil. 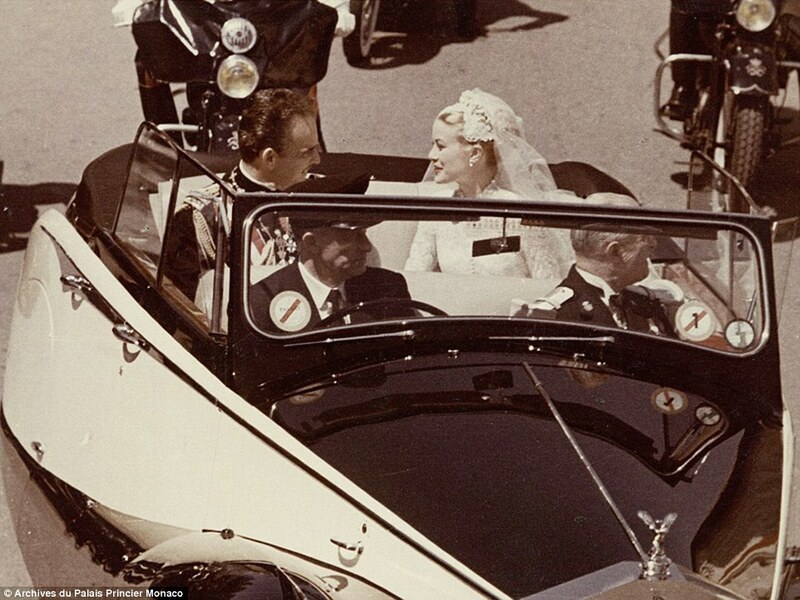 Grace Kelly’s wedding headpiece was created on a wire frame. The Juliet styled cap was enhanced with seed pearls and wax orange blossoms. The circular silk net veil required over 90 yards of tulle and was specially designed so that the bride’s face could be seen. It was accented with appliquéd lace motifs which included two tiny lovebirds. Sydney Guilaroff, the chief hairstylist at MGM Studios, styled Grace’s hair for the wedding. 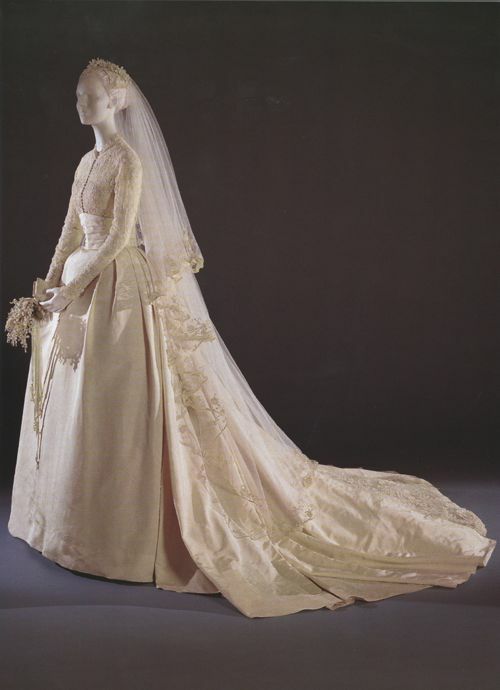 Her Serene Highness, Princess Grace, gifted her gown to the Philadelphia Museum of Art in 1956. It is currently not on view. The prayer book was the “Bride’s Manual: A Manual of Catholic Devotion with Mass for the Marriage Ceremony and the Nuptial Blessing”. It featured a gilt edge and contained prayers, hymns, meditations, and information in accordance with recent pontifical decrees. The book was a gift to the bride from a longtime friend of the Kelly family, Mrs. John F. McCloskey of Chestnut Hill. Here you can see the exquisite detailing of the antique Brussels rose point lace and the hand-sewn seed pearls. 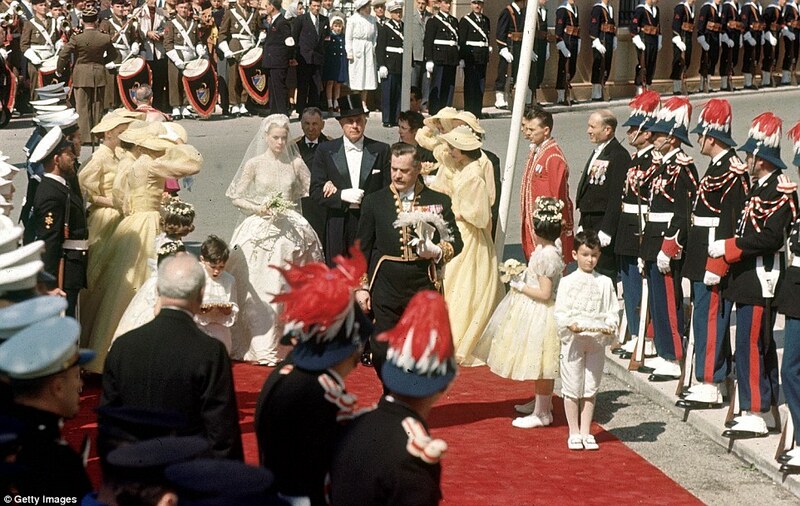 Prince Rainier and Grace Kelly could not have asked for a more picturesque day than April 19, 1956. The wedding service began at 9:30 in the morning. She entered Saint Nicholas Cathedral on the arm of her father, John B. “Jack” Kelly, Sr.
At the altar, she and Prince Rainier had been instructed by church officials to not look at one another as it was a serious occasion. 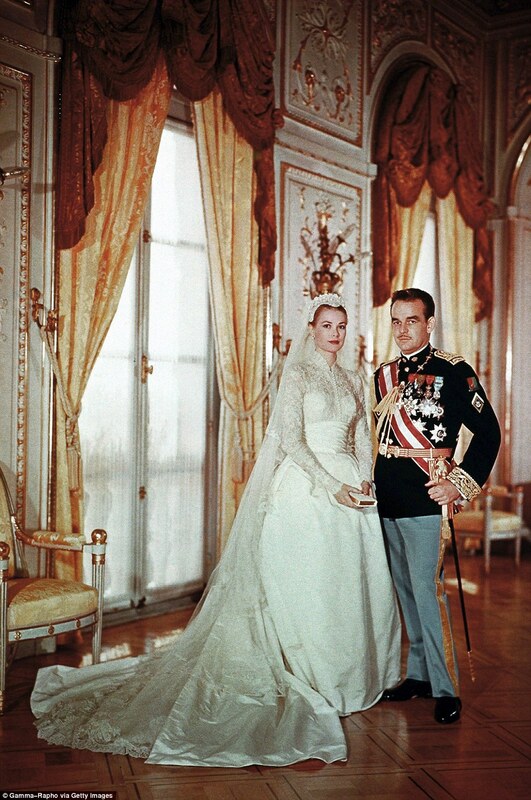 Prince Rainier had The House of Creed create a perfume for his new Princess to wear on their wedding day. It was called Fleurissimo and can still be purchased today. Prince Rainier designed the Napoleonic military-style uniform that he wore himself. The black jacket featured gold leaves on the cuffs. His pants were a light blue and featured a gold stripe down the side of each leg. A red and white sash representing the Order of St. Charles hung across his chest. The medals represented Prince Rainier’s and Monaco’s links in Italian and French military history. Bishop of Monte Carlo, Monsignor Gilles Barthe, gave the bride and groom the nuptial benediction. The service itself was a traditional Catholic wedding ceremony. 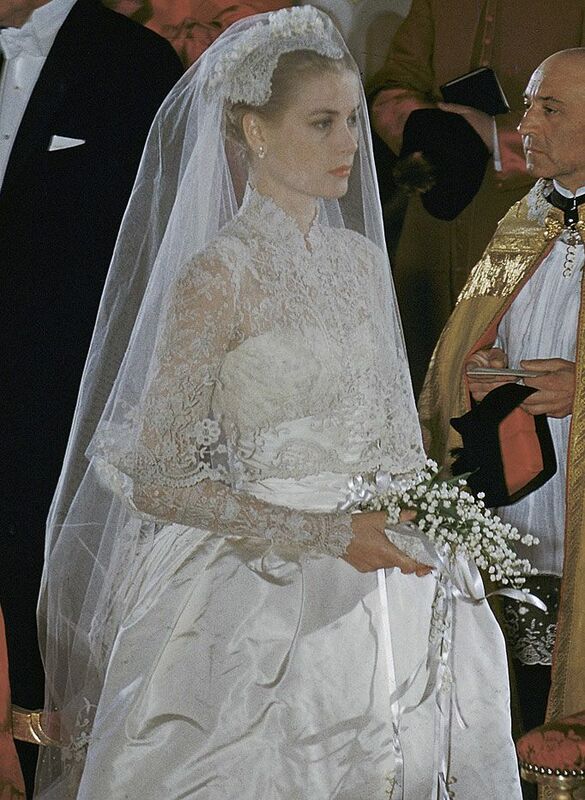 This image of Princess Grace in prayer provides a lovely close up of her Juliet styled cap and veil, pearl earrings and the detailed lace of her gown. 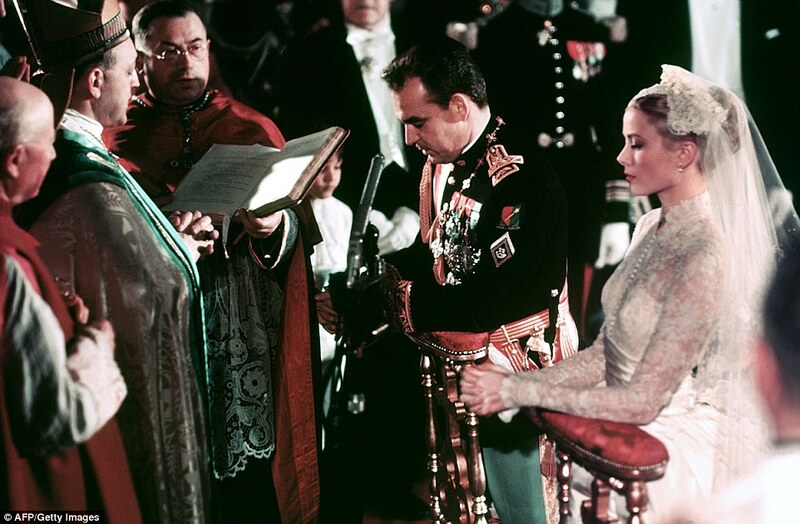 In later years Princess Grace admitted that she had preferred the quiet and intimate civil ceremony over the religious ceremony because it became somewhat of a spectacle due to the MGM camera crew and hot lights that were necessary to film the wedding. This was an agreement the Royal couple made with MGM so that Her Serene Highness would be let out of her seven-year contract. The hat that Prince Rainer wore was a blue helmet much like those worn by the “Carabiniers” (Spanish Calvary soldiers) in charge of the Royal couple’s security. The helmet was enhanced by an ostrich plume. Joy and relief seem to be written on their faces. The happy couple awaits the arrival of their wedding car. The convertible Rolls Royce was a wedding gift to the couple from the Monegasque people. They toured the streets of the small Principality before returning to the palace. The couple walked into the throne room so that they could be photographed. Her Serene Highness, Princess Grace and her attendants. The matron of honor was Grace’s sister, Margaret “Peggy” Kelly Davis, bridesmaids were Judith Balaban Quine (friend), Maree Frisby (high school friend), Sally Parrish & Bettina Thompson (both classmates from the Academy of Dramatic Arts in New York), Carolyn Scott (her best friend and modeling companion), and Rita Gam (actress & friend). After searching for over two hours I could only come up with the name of one of her flower girls, Margaret Ann “Meg” Packer (Grace’s oldest niece). The three remaining flower girls and two pages are unknown at this time. The bridesmaids carried bouquets of pale pink tea roses. Their gowns were designed by Joseph Hong of Neiman Marcus and were made by Priscilla of Boston. The dresses were made in the bride’s favorites color~ pale yellow (referred to as “sunlight”). The top layer of the gown was fashioned from sheer silk organdy and featured a high necked collar and full bishop sleeves. The fitted bodice had a pleated sash and full skirt that flowed into a short train. The organdy gown was layered over a strapless silk taffeta underdress. The simple bonnet of yellow silk organdy was designed by Joseph Hong and made by Don Marshall. The four flower girls carried a bouquet of daisies. Their dresses were also designed by Joseph Hong and made by Formals by Mary Carter. The top layer was made of white cotton organdy and featured white and yellow daisies that were machine embroidered with silk thread. The dress had sweet puffed sleeves and a collar that was similar in style to the bridesmaid gowns. The underskirt was made of yellow silk taffeta. A simple wreath of daisies was worn as a headpiece. After the portraits were completed the couple emerged onto the palace balcony to greet the large crowd of well-wishers. I could not find what was served at the luncheon but thought Margaret Kelly looked especially lovely as the mother of the bride. At five in the evening, the newlyweds boarded their yacht, the “Deo Juvante II” (With God’s Help) to begin their honeymoon. The yacht had been a wedding gift from Aristotle Onassis. They cruised the Mediterranean and the honeymoon was deemed successful as their first child, Princess Caroline, was born 9 months and 4 days after the wedding. It was indeed “The Wedding of the Century. Laura, a most poignant post of this Royal Wedding. Your research is so thorough, with many facts I certainly did not know. Grace, living up to her name in all ways! The gifts to the royal couple from the wedding gown itself to their honeymoon yacht! Thank you so much for sharing this occasion with us. such wonderful loveliness! thanks for the education. So beautiful. She truly had such “grace” and poise. Thank you for your efforts in sharing this beautiful event with us. Laura, this is the best coverage I have ever seen of this wedding! Grace was pure class. I love seeing her board the yacht with her poodle in arms! It's a lovely walk through the wedding day. 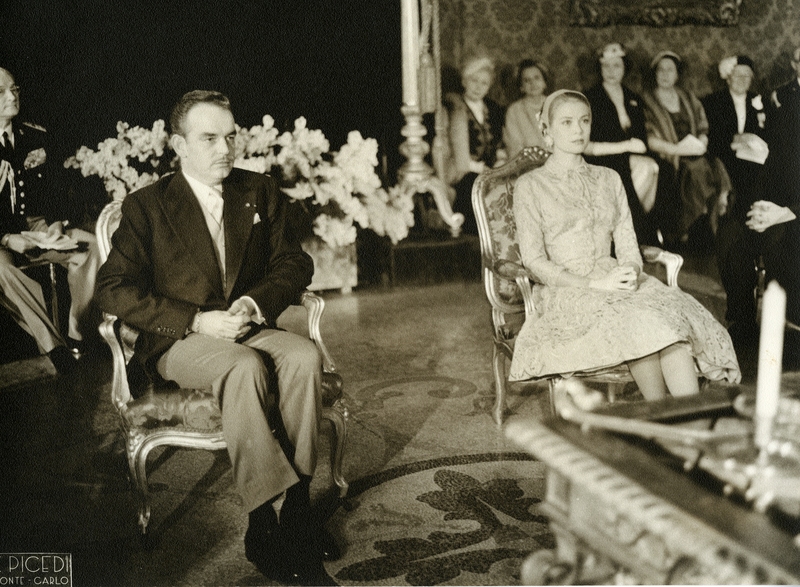 It always seemed that Princess Grace and Prince Rainier never smiled. I hope they had happy loving moments when they were not in the public spaces. I'm worrying about Charlene's expressions after so much open-air and hoopla of wedding. She doesn't have Grace's (does anyone?) sweet faxis and if Grace was that serious and tired, can you imagine Charlene?! Your investigation and building of the post couldn't me more Royally Perfect. You're a Queen of Royal Weddings Coverage, Sweet Laura. Wow. Impressive post. Thanks for the history lesson. Fascinating. Enjoyed your post on the beautiful Grace Kelly! This is a wonderful post. I went on a cruise around Hawaii for my honeymoon 20 yrs. ago and unbeknownst to us our ship was the very same that Grace Kelly took on her voyage to Monaco to wed. The ship was called the USS Constitution and was owned by the American Hawaiian Cruise line when we were on it. It had a purple room dedicated to Princess Grace. It was getting old and I am sure they have retired the ship by now, but it had also filmed and episode of Magnum PI. It was such a classic old ship, but many passengers were very disenchanted with it because it wasn't as modern as the Caribbean cruise ships the had been on. My husband and I enjoyed it and is still the one and only cruise we have ever been on. Oh, Laura! You have given us a great gift. What a beautiful post. So well researched and exquisitely put together! I admire Princess Grace greatly. Her title was so fitting… Her Serene Highness! Thanks you so much for all you do to bring all of us such a ROYAL TREASURE! AMAZING POST! I loved all the photos. Do you have a particular book that came out of? I would love to have it if you would tell me the name. THANKS FOR SHARING! Thanks for stopping by my blog. I am so excited to have found your blog, it is wonderful! I love the post of Grace, she was the most gorgeous woman and that was a beautiful post. Another wonderful post! Thanks for sharing all of your research. This was awesome to read! I never knew much about this wedding. Thanks for doing all the research! 😀 So cool! Oh my gosh! Wasn't she just GORGEOUS!!! WOW! So, this may just show my ignorance of such things, but why was the wedding portrait infamous? I can only imagine the hours of research it took for you to complete these posts. Thanks you for all your efforts. Truly enjoyable! Wow! Lots of information. I really am enjoying your Wednesday posts. What an amazing wedding! Thank you for the time you spent putting this post together….I was only 3 yrs old and I feel like I was there….bravo! Really enjoyed reading all about this fairytale wedding! It's “unofficial” but has the names of the attendants!